Fresh pasta has a soft, silky texture that’s quite different from cooked dried pasta. Though making your own pasta from scratch will likely take a while the first time you make it, you’ll find it gets easier and faster the more you practice. Traditionally the “well” pasta technique is done on a flat surface. However, if you’re concerned about making a mess you can do the initial egg-flour mixing (mound, well, etc) in a large, wide bowl, then move everything to your counter once it has become a knead-able dough. 1. Make the flour into a mound on a clean large cutting board or counter. Make a large well in the center. 2. Crack your eggs into the well. 3. 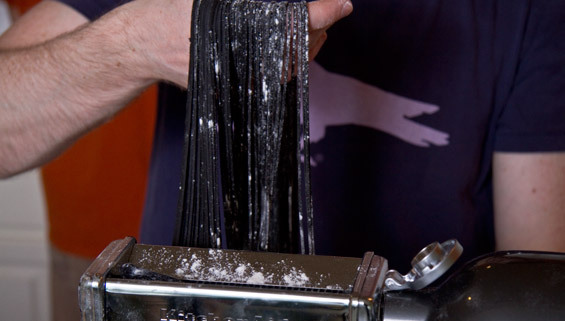 If making squid ink pasta, add it and the olive oil to the eggs. 4. Using a fork, break the egg yolks and mix them up. 5. Begin to slowly draw in flour from the sides of the well and stir it in, taking care to shore up any walls that begin to collapse. 6. Continue to mix in flour until the mixture becomes a dough. 7. Switch to kneading. Knead for at least ten minutes to develop the gluten, adding additional flour as necessary to get the right consistency (silky, slightly sticky). If your dough becomes too dry, you can sprinkle or mist it with a little water. 8. Wrap your finished dough as a ball in plastic wrap and rest it in your refrigerator for at least 30 minutes to allow the gluten to relax into the right elastic consistency for rolling. 9. Set up your pasta machine according to the manufacturer’s instructions. 10. Lightly flour your counter or large cutting board. Cut your pasta ball into quarters. Work with one quarter at a time, covering the others with a towel to keep them from drying out. 11. Flatten the first quarter with a rolling pin until it is thin enough to pass through your pasta machine on its widest setting. To prevent sticking, sprinkle a little flour onto the machine’s rollers. 12. Pass the pasta through the machine, then fold the dough back into thirds, press down with the rolling pin (taking care not to incorporate air bubbles), rotate, and send it through the machine again. Repeat until you’ve run through the machine six times in total, lightly re-flouring the pasta dough as necessary to keep it from sticking. If you’re hand cranking, try to maintain a constant, even speed (motorized machines make this much easier). 13. Reduce the rollers’ distance one setting, and repeat the rolling process three times. Repeat until you reach your desired thickness. Generally for pasta strands (spaghetti, linguine, etc) you want to roll pasta out to the #6 thickness setting. Note: If you’re going to be using this pasta to make ravioli, keep in mind that portions of the ravioli will be double-thick, so you’ll probably want to roll the pasta sheets out extra thin. 14. If making strand pasta, either hand cut it or use your machine’s cutting rollers. If roll cutting, be sure to support both the sheet at the top of the rollers and the strands coming out the bottom of the rollers. Once the pasta has been cut,dust it very lightly with flour to keep the strands separate, cover it with a towel, and begin working with the next quarter of the dough. A) Too wet. Dust it with more flour between rollings. B) Too dry. 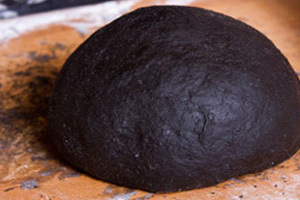 If it’s really dry you’ll likely have to start over with another quarter of your dough, but you may be able to save it by lightly sprinkling (ideally misting with a spray bottle) it with a little water, then kneading until incorporated. Depending on how much you knead, you may also need to re-rest. C) Too wide, so it’s getting caught on the edges of your machine’s rollers. Trim the sides.